Please use the link for this month's musings! Yep, that’s me. Nudging these kids, one a time, to access current, vetted resources through the myriad of Google alternatives residing on the school library website! If you are like me and see large classes of middle school students each week, but seldom get to spend quality time with each student individually during it, you might have discovered that sometimes your database sales pitch simply works best in the rare moments that simply present themselves, as opposed to the en masse approach in class. It’s what I am up to these days, and it’s pretty fun. It happens every week: twenty-odd 7th graders leave one of my digital citizenship classes looking a little worn out from another long day of school (I have all my middle school classes last period! ), and I despair that hardly a one really got the message about using the current, accessible, relevant and trustworthy resources available to them through the library. I pin the links everywhere--the library site, the shared class docs, the e-newsletter to families each month, on hand-outs at the circulation desk and signs at the desktops--seriously, I can’t get enough. But I still worry that these kids aren’t paying attention and using them enough. So I have a new technique. The first part of it is being aware when opportunities are presenting themselves for the database sneak-attack. Instead of continuing on with what I am doing--shelving, processing a book, planning the next day’s lessons, insert-another-task-here--I force myself to connect with the student who has just meandered in. I casually say hi, ask if he or she is reading any good books lately...then, I go for the gold...I find out what kind of research project is going on in a core subject. And, just like that, I have that kid hooked to come on over to the computers so I can showcase the perfect resource we have for whatever topic was just mentioned. I have done it twice today. Now, I could get depressed that the 8th graders last period seemed to be Googling too much to find research for their class newspaper pieces, but instead I am going to look for the positive in the afternoon--that after lunch I got two students using VT Online for their up-to-the-minute research on designer babies. That was awesome. They were into it. They “never knew this stuff was here, Mrs. Eckhardt!” Um, okay, I’ve been carrying on about it all fall, but whatever. They joined the ranks of database users at Danville School and I am thrilled. So are they. Their research projects will be awesome. So, that’s my goal--to quietly and simply hook a kid or two a day on database usage. No, it’s not a lot. No it doesn’t make the earth shake in some instantaneously noticeable way. But it does change things--the flow of accurate information, students’ understandings and perceptions, the quality of their work...and pretty soon it might just be a normal thing that the whole upper school is bonkers about using databases instead of the www at large. I could get back to that pile of books that need covering, or that shelf-reading...nah, I’ll probably just ask to read their final papers. If only everyone could hit the rewind button on what it takes to set the stage for personalized learning to occur honestly, happily, actually. In a perfect high school setting in the 21st century students are psyched to come to school, where they are welcomed and honored for who they are, what they wish to learn and who this will allow them to become. Tech options are available and streamlined. Blended classroom pedagogy offers a fabulous hybrid platform that meets each kid where they are: the shared class docs are never defaced by those who refuse to become responsible digital citizens, the playlists curated by teachers have “something for everyone” and the time allowed in class for real academic and personal interaction among students and teachers is filled with meaning that inspires the growth of soft skills that support students as they focus on learning the hard ones. The recipe is pretty simple. Imagine the high school class that hums along as some are plugged in utilizing the array of online resources prepared for them (and also finding their own), while others are engaging with the teacher who is explaining/listening/expanding per individual or small group needs. There might even be a small group of collaborators, collaborating in a sacred classroom space, making their own little hybrid situation of tech, discussion and problem-solving increase their learning, with the underlying understanding that plugging oneself in or deciding to utilize the teacher’s expertise is also an option, and it’s all good. I dream about this kind of stuff. Don’t we all? In this digital age it seems like it should be a natural thing in schools across America, this perfect blend of person-to-person teaching coupled with efficient use of all that technology has to offer, based on student need and interest. So why is it often so elusive? Why do we continue to struggle with personalized learning? Well, because people are complex. So many variables. The confluence of so many preceding details gets in the way. In order for personalized learning to truly take place--to thrive and function in a high school setting--we need to build up the capacity for it from the early years of school. Children need to have the flames of wonder fanned in a way that allows them to internalize an appetite for life. Not a life of video games and Netflix, but for living. They need to be taught to read for sustained periods of time in which they metabolize their very own personal ability to dig in and understand. They need to learn how to be with themselves, their peers and their teachers. They need to have inculcated in them a respect for themselves and their peers and their teachers. Somehow, their experiences in the early years of school have to provide opportunities for them to become literate, joyful little problem-solvers who have internalized the wonder of being alive, and the fact that there is meaning in the everyday as well as the stuff that is “awesome.” That it matters how you act just as much as it matters whether you are becoming better at the things your teachers are trying to help you learn. That it feels good to like who you are and to also be a good friend. Kids need to be really and truly prepared to embrace the personalized learning opportunities we wish for them as young adults. That means they have to come to the high school level intrinsically motivated to learn (lots of soft skill teaching in there) while possessing a decent skill set around literacy, numeracy and communication skills, and some basic technological know-how. It is a pretty tall order, but at the same time pretty basic. Time spent investing in a road map through the elementary and middle years, with personalized learning readiness as its goal, could change the world. Educating grade schoolers is three-fold: it is socializing them and teaching them basic academic know-how, all while embracing each and every one of them for who each and everyone is! It all starts with respect. Respect the emotional and creative person each kid is, and respect every potential he or she has. Respect the social norms that allow us to all get along. Respect the enormous power of the various literacies in which we need to become fluent so we can reach our potentials and have purposeful, interesting lives. And keep circling back to all of it so that when it is time for the high school years, personalized learning is the natural progression. Ideally, if those elementary years go well, we have children who want to use their personal and academic sensibilities to learn about what interests them. They have been taught that learning is fun, that it can also be hard, but it’s worth it. They have learned they are capable. They have been taught how to get along. They have a natural respect for their teachers because their teachers have provided so many opportunities that have helped them become who they are becoming. They have been taught not only how to read, but how to persist in one’s reading to wonder and find out more. Their middle grades curricula were designed to teach students how to read effectively online (that is a whole other blog). Digital citizenship is a fact of life and kids can be trusted to fire up their school-issued devices and do the right thing. Trust and respect have been such a long-standing part of their education that getting along in school as a person and a student is just not much of an issue. Students see their ability to function independently as part of a group as normal. The boundaries and skill-building experienced consistently throughout childhood set them free. Sounds like good parenting. Sounds like healthy human development. Sounds like the best idea ever. Ah, school...now we remember why we became educators! School does not need to be “unschooled,” as so many critics proclaim. It can be the healthiest place for a community of kids to show up and live their lives while they learn to live their lives. So, now what? This blog is kind of all over the map, I know. There are a dozen spots where it could digress, begging the questions that are out there about the grades and walls and bureaucracy that continue to cramp the modern dreams of so many public schools we continue to require all children to attend. So let’s not go down those rabbit holes today, but think about a bigger picture that could just be inspiring. That might inspire us to do a little better in making the small moments we are in charge of now better, and that might help us articulate and implement the newer version of school so many of us wish for. Elementary and middle school need to be the breeding ground for successful personalized learning in the higher grades. Teenagers and teachers have so much real world teaching, talking and figuring to do, that the concepts and practice of being a good community member, a respectful and tech savvy digital citizen and capable reader need to be givens. It is a huge order, I know. It means us taking apart a lot of what is done and putting it back together more carefully. It means finding common ground and celebrating autonomy amid the behavior crises with which so many children come to school. It probably means sometimes putting academic learning on the back burner to help kids get themselves sorted out so learning can come easier when they are then ready to learn. Yup, a huge puzzle that looks like a hundred different pieces in any given school. Now, more than ever, we as educators need to be as human as possible so tech can take its rightful place to extend the personalized opportunities awaiting our young adult students, who, if “raised right” in our schools, want to go out and take on the world. Education is a very human task. All the technology available for personalized learning is meaningless unless those accessing it are doing it from an intrinsic desire to learn and grow, independently and within a group. They need to feel a part of a community that counts among its most cherished ideals as those of wonder, respect and responsibility for doing one’s best. As one dedicated early educator at my school has as her tag line beneath her email signature, “Let them be little. Inspire them to be BIG.” So, yeah, our work in schools is continually cut out for us. We can’t afford to work in silos, we need to include parents in the mix of molding youngsters who are glad to be alive and who can’t wait to find out more about their world and themselves. Let’s build school communities that include an unwavering insistence on being responsible, respectful and literate. A civil snack time is as important as tackling an assignment with grit and reflection. Being kind in the bus line matters as much as learning basic tech skills in those early grades. A hearty, healthy recess goes hand-in-hand with perfecting the times tables. Imagine a group of teenagers who are not pushing their teachers’ buttons because they are so busy pushing their own, in a good way, because life has been so sweet in those earlier grades that they are ready to accept personalization of their learning because it is the next logical step. That they can work independently, among others and within an intrinsically respectful relationship with the adults who are, well, still in charge, in the most positive of ways. Wow. What a beautiful thing. Achievable, too, if we as educators start from the beginning and build with this goal in mind. While tech avenues and the continual information they bring to our students may outshine our expertise in certain academic subjects, our expertise can continually grow as the stewards of their growing up with the dignity and respect that are at the root of successful personalized learning at the high school level. I would like to begin by thanking the VSLA Scholarship Committee for supporting my travel for professional development to attend the AASL National Conference & Exhibition in Phoenix. While there I was able to attend many sessions to include the unveiling of the new AASL standards, sensitive topics like diversity, MakerSpace ideas, feel the power of stories in picture books, gain knowledge about how to garner support for my library program, successful research ideas in the digital landscape, author meet + greets, using picture books to engage with STEM ideas, weeding for greater engagement, and many others. The networking and collaborating opportunities were amazing and unparalleled. Being refreshed and engaged in Phoenix helped me to return to my library with fresh ideas and and an action plan. Above all, this profound opportunity would not have been made possible without VSLA's generous scholarship. Being my first library conference, I was not really prepared for the magnitude of what was there, but easily embraced it. Meeting iconic authors like Jack Gantos, Judy Schachner, Melissa Sweet, and Drew Daywalt to name a few, was thrilling and unparalleled. Thank you, once again, for allowing me this opportunity. The Danville School Library got a new database this fall, ABDO’s S.T.E.A.M. offering for grades K-2. I am going to admit I was rather utilitarian about it. I needed to freshen up the electronic offerings for the small-fry--something besides BookFlix and the tidbits I am forever inserting on the elementary library web page. The ABDO offering came through the mail on a snazzy card, offering a free trial and all of that. I tried it, it was fine, that was nice. Never terribly invested in science and math myself, but knowing that the K-1 teachers built a dedicated S.T.E.A.M. workshop into their days just last year, I ordered the product thinking I’d just push the timely topic out for folks to use. I figured the database had the subject under control, so it wasn’t like I needed to become an expert, right? Well, it turns out this S.T.E.A.M. stuff is so much fun I am becoming one, despite those awful science and math grades in high school! All of sudden, some component of the subject is everywhere, and it has become the driving force behind all my recent elementary programming. Who knew? And my background in the liberal arts is coming in handy, too, which is just making things that much sweeter. (More on that later.) 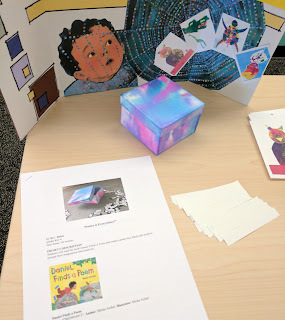 Of course, I am the first person to crow about a Matisse cut-out or a Calder mobile, but to have beautiful picture books do the crowing and S.T.E.A.M.ing for me? Perfection! Then, whip up a few tidbits on the website to go with and everyone is happy and curious inside and outside the library! Seriously, it is delightful. This week’s feature is Jacques Cousteau, the penultimate S.T.E.A.M.er--and showing kids a clip from that awesome 70s TV show, The Undersea World of Jacques Cousteau, is more than icing on the cake. Besides taking me back to cozying up on the shag carpet in the den on a Sunday night forty years ago to be amazed by what was going on aboard The Calypso, watching the delight and amazement brew among the kids is a certain brand of perfection. But back to my comment about the liberal arts. There is a fairly robust conversation going on in higher education these days about whether they are all that pertinent in the technologically advancing 21st century. I see where that argument comes from, that folks are afraid the “fluffy stuff” might actually get in the way of the next generation figuring out how to make surviving on this planet a doable thing. But then when I see how my background knowledge of history, art, and literature open the door for me to be zealously leading a S.T.E.A.M. effort at school, especially when I had no plans for getting this darn excited, I realize that the liberal arts are my way into understanding S.T.E.A.M. And why it is such an important, necessary topic in today’s world. Now, I am fully aware that plenty of people with more of an affinity to science and math might not need the liberal arts key to gain access, but I am going to argue that they will be able to get more out of their study if they have some knowledge of the more human side of it all. Who began the train of thought that led to any technological improvement we see now? What was going on historically that makes this person’s vision all the more meaningful and extraordinary? What kind of meaning might this have for people when daydreaming about inventing that thing or solving that problem? It’s the yin and yang of all the disciplines, it seems, that keep humanity evolving. And therein lies the beauty of our favorite spot, correct? The Library. The keeper of all disciplines, the landlord of literature. The way that so many bits of information and so many stories can be put together to foster curiosity, understanding, and knowledge is astounding. As for me, my first epiphany of the school year began with a little glossy postcard from ABDO Publishers. I honestly had no idea...wish me luck as I host Danville school’s first-ever Makerspace club! This was my first ALA Annual--and my first time in Chicago--and connecting with colleagues from all over the country was an intensely powerful experience (actually it was international, there was a delegation of German librarians that presented about how they support their refugee community, this is a video they produced to introduce refugees to the library, it has no speech but communicates perfectly). I commiserated with with a group of librarians about the difficulty of finding a good vendor for non-English books while touring the new children's section at the Harold Washington library. I spoke with a public librarian named Aurora from New Orleans who told me about a new initiative where they were providing breakfast and lunch to all comers in the library; she said it was a struggle getting everyone on board but it has been just hugely satisfying feeding hungry children. I had a hundred little conversations that affirmed my struggles and inspired me to do more. I got to fly a drone! I saw a book check-in machine that will replace my assistant as soon as they make a version that has deep empathy for children, an uncanny intuition about teenage misbehavior, an ability to talk me through those days, and maybe also can laminate posters. I did not get to meet Linda Sue Park (I was at Hamilton! ), but I did send a surrogate to get a book signed (thank you Cheryl!) And I got to ask Andy Wier a question! Q: How did you ensure scientific accuracy in Artemis? A: Google. JK! Research and math. Sometimes wrote code to figure it out. My favorite session was Diversity Officers Discussion Group, which I attended because of a misunderstanding. I did not realize that Diversity Officer is a job title, I thought it was just a general discussion about diversity. As soon as we went around the room introducing ourselves, I realized my error, I was sitting next to Jo Anderson Cavinta who runs the diversity program for the King County Library System (which contains Seattle and serves over 2 million patrons). The room was full of HR directors for massive public library systems, and here I am the lone school librarian from a 1.2 mi² town in Vermont. But it was amazing! I told them that we are a school with fifty percent students of color but an all white faculty and they proceeded to give me practical advice about how I can slowly affect the process of changing that. Things like widening where we advertise positions (not just School Spring! ), increasing the travel budget for applicants, and finding ways to connect applicants with minority communities when they visit. It was an amazing experience and I am so grateful that VSLA helped make it happen! If you would like to apply for a VSLA Professional Development Scholarship fill out this form. The experience largely involved 2 day long seminars; one at ALA Midwinter in Atlanta and one at ALA Annual in Chicago, virtual work in the months in-between both conferences, and a culminating poster session. We discussed leadership, learned about the inner workings of ALA, met some important folks including ALA President Julie Todaro and President-Elect Jim Neal, ALA Executive Director Keith Fiels, and more! Maureen Sullivan, former ALA President, and Audrey Barbakoff, an EL alum, were wonderful coordinators who guided our seminars. We also had opportunities to work with our group in person. I was chosen to work on a project for the American Association of School Librarians analyzing the impact of the ESSA workshops held in over 40 different states (and D.C.) on school library advocacy. My wonderful group members and I developed a survey, sent it to state affiliates and asked all those who attended participate. (Vermont had 17 responses-more than any other state-thank you!) Next, we followed up with state affiliate representatives with a series of questions to further our understandings. I was fortunate to speak with representatives from the New England states, and Michigan, where I felt a great camaraderie. Finally, we analyzed our data as a group, and produced an executive summary and infographic which will soon be available on the AASL website. Data showed that the workshops were very helpful in increasing advocacy of the school librarian! I am grateful to VSLA for sponsoring me and highly encourage other folks to apply to this wonderful program. I made so many new friends and met so many new colleagues. I learned a lot about myself and gained confidence as a leader. I plan on updating my (sparsely updated) blog soon about my conference experiences as a whole: http://noshushingallowed.blogspot.com. Also, feel free to follow me on Twitter: MsD_Reads_vt. Check out Alyson Mahony's reflection on her Dynamic Landscapes experience. She was the recipient of the Professional Development Scholarship. I'm here at Dynamic Landscapes in beautiful Burlington, Vermont today and yesterday (which was rainy and less beautiful). 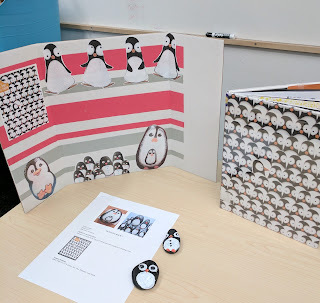 There is so much great information here and inspiring student projects. Yesterday I attended a presentation panel about Book Battles and a variety of ways do host them. I am excited to do a Dorothy Canfield Fisher Book Battle with my 4th and 5th graders next year! In the afternoon I went to a fun workshop about "Putting the Creative in STEM" where we played with Spheros, Dash, and a basketball that can provide feedback to help you improve your game! This morning I attended a presentation by Diana Laufenberg about how help kids determine what is true in this age of alternative facts and truthiness. There was a great discussion about what it means to be a kid these days and from that I came away with several ideas include in my digital safety lessons. I just finished an eye-opening presentation on copyright and the Creative Commons. So much to know and so much knowledge to share! On deck for the afternoon is info about Vermont Online Library, Red Clover books, and putting it all into action! UPDATE: The Red Clover presentation was excellent and full of creative ideas by Beth Redford and M.C. Baker. 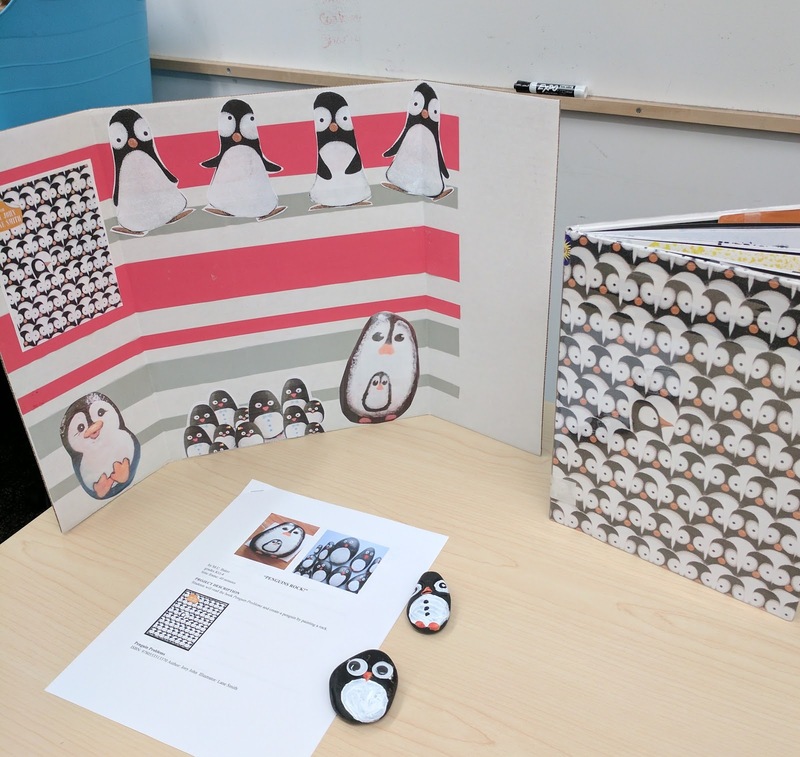 Tiny little rock penguins to accompany the book Penguin Problems, by Jory John. Art project by M.C. Baker. M.C. 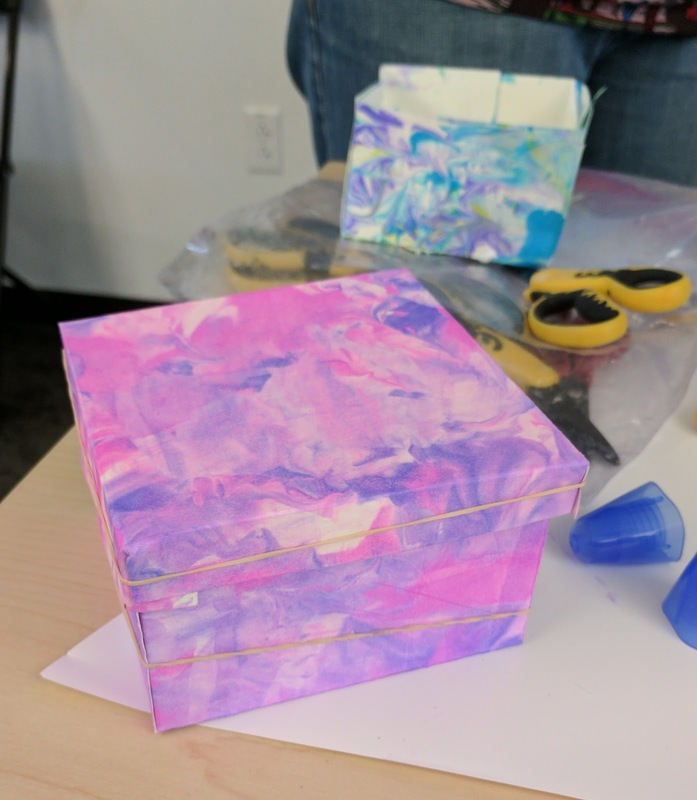 Baker had a fun "marbled box" project to go along with Daniel Finds a Poem, by Micha Archer. The box is a beautiful place to keep your words or poetry, and the project is so easy and fun! Art project by M.C. Baker. This is the box I made! The rubber bands are holding it together while the glue dries. After the Red Clover presentation I ended up going to a panel discussion called "Empower, Educate, Engage: Combining Data, Stories, and Conversations to Develop Community Partnerships at All Levels," led by Heidi Heustis. This was panel covered a variety of topics including data collection, identifying key stakeholders, promoting your library, and more; all around the idea of increase awareness about who you are and what goes on in the library. I came away with a better understanding of the importance of tracking data, communicating with stakeholders, and documenting accomplishments (and data) each year.